This piece has been a long time in the making. I started designing it well over a year ago, and took about ten months to get it built--a lot longer than I expected. 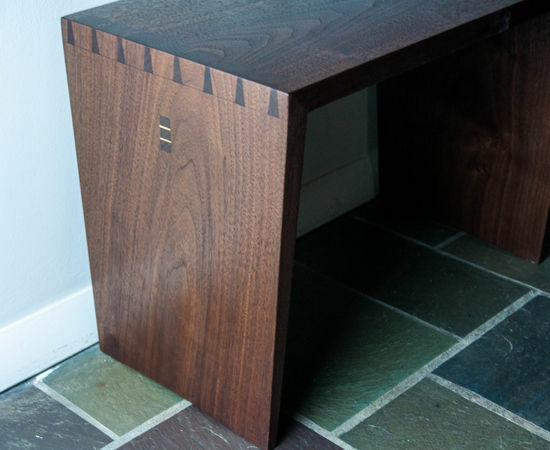 The wood comes from two Black Walnut trees, both sourced from the Hudson Valley region in New York. Most of the hardware is stainless steel. 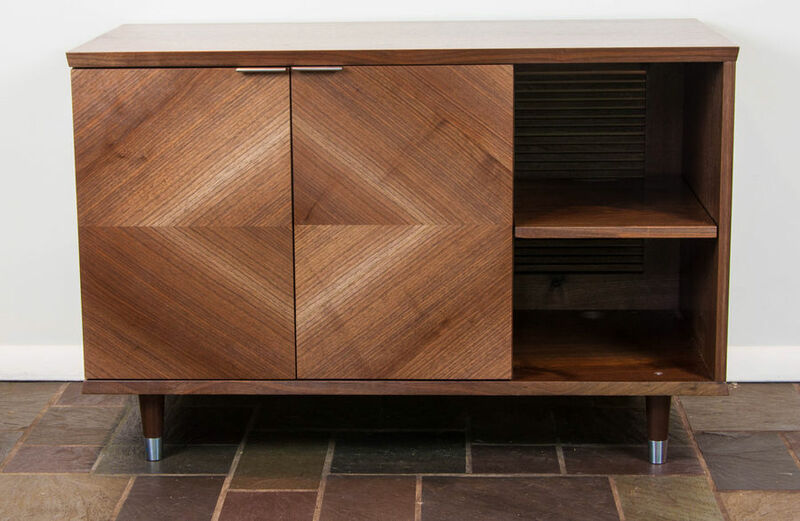 The design is original, with a strong mid-century influence. 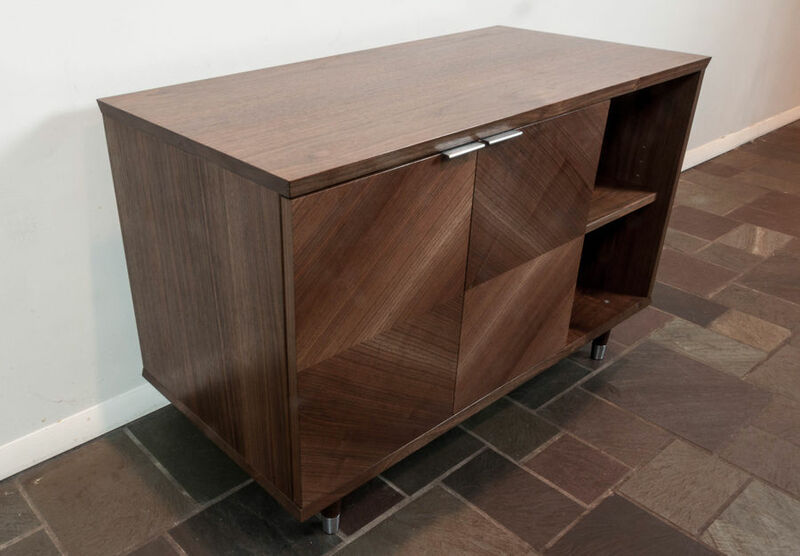 The veneer layup on the front is inspired by a door that appeared in the move Desk Set (1957). View from the front. 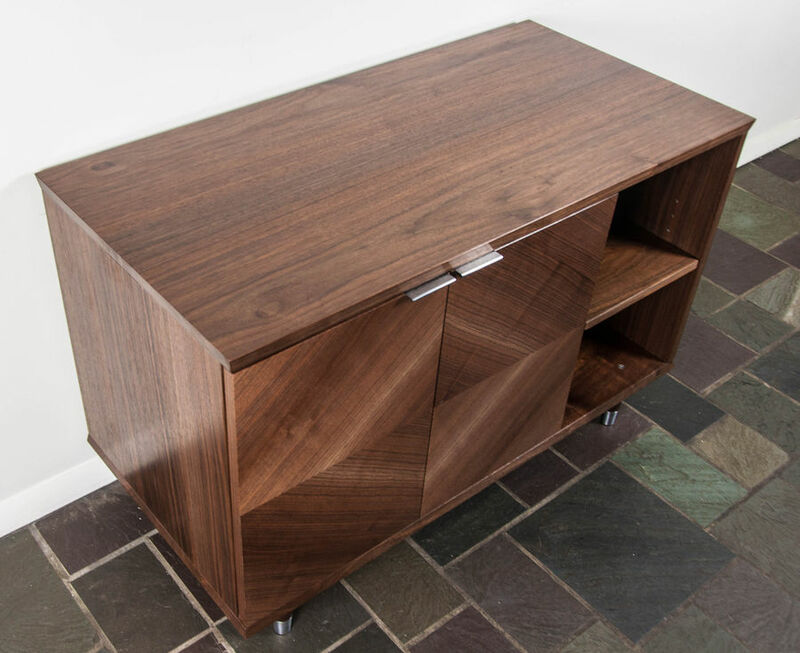 The veneer pattern is inspired by a door that appears in the movie Desk Set (1957). 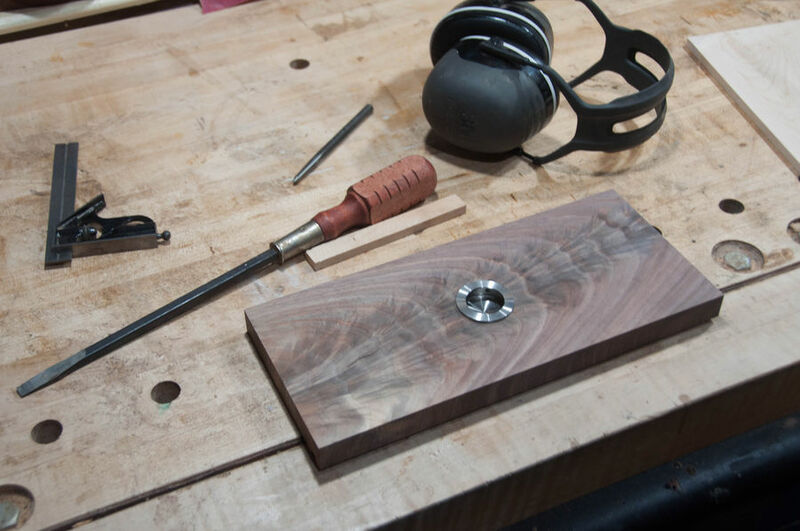 The entire piece is made from air-dried Black Walnut from the Hudson Valley in New York. The hardware is stainless steel wherever possible. 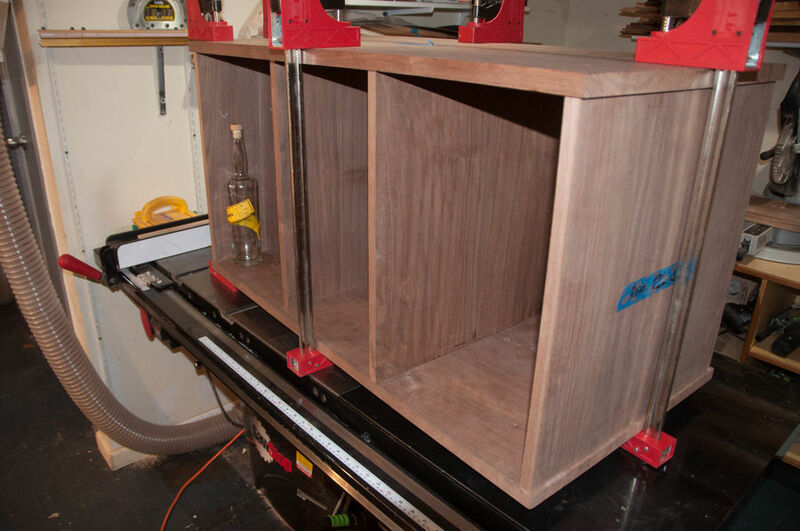 The left bay is designed for liquor storage. 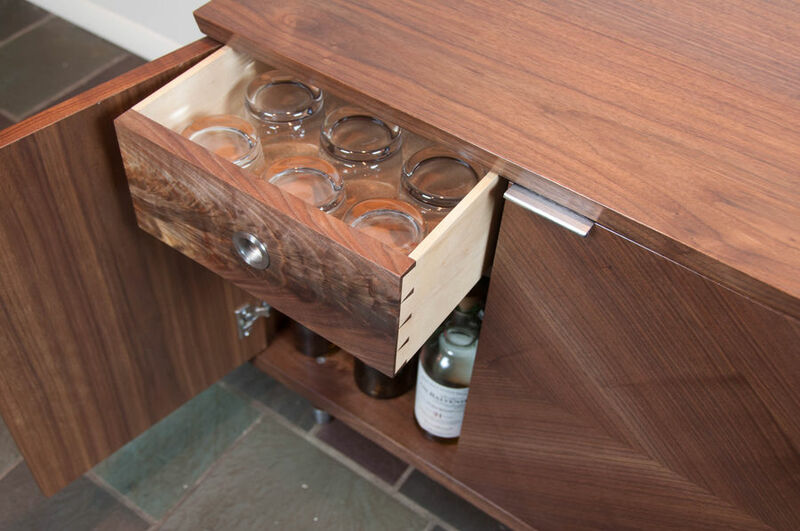 Bottles on the bottom, with room for glassware in the drawer. 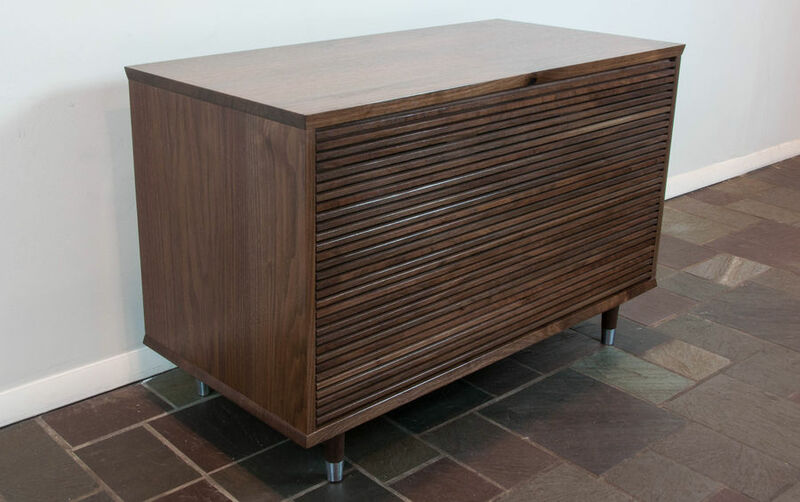 The drawer front is a solid piece of Black Walnut crotch sourced from the same tree as the outside of the credenza. 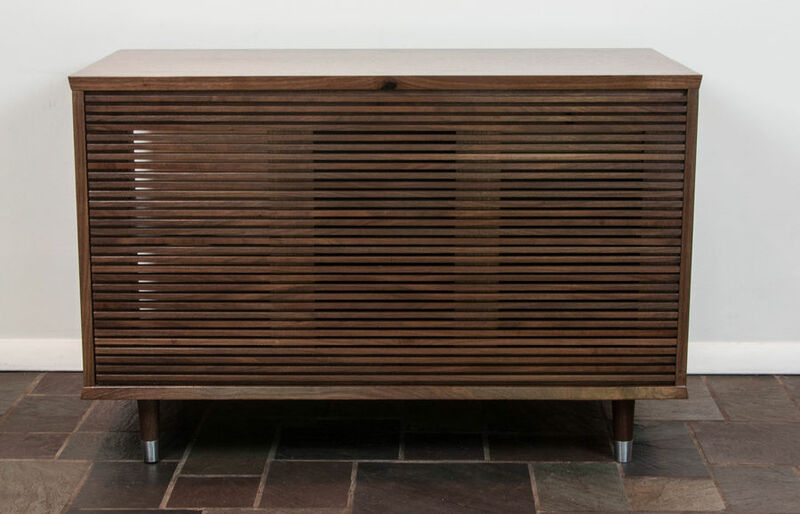 The slatted back was one of the earliest details that made it into the design. 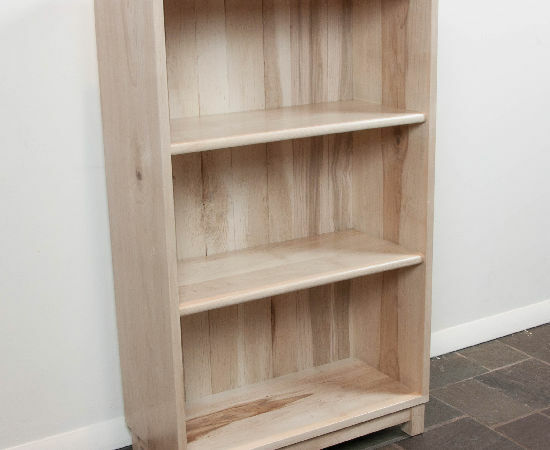 This piece is presentable from all sides, since it will function as a return in my office as well as a room divider to separate the office space from the rest of the house. The top is book-matched, totally clear, and practically seamless. Token lifestyle shot. 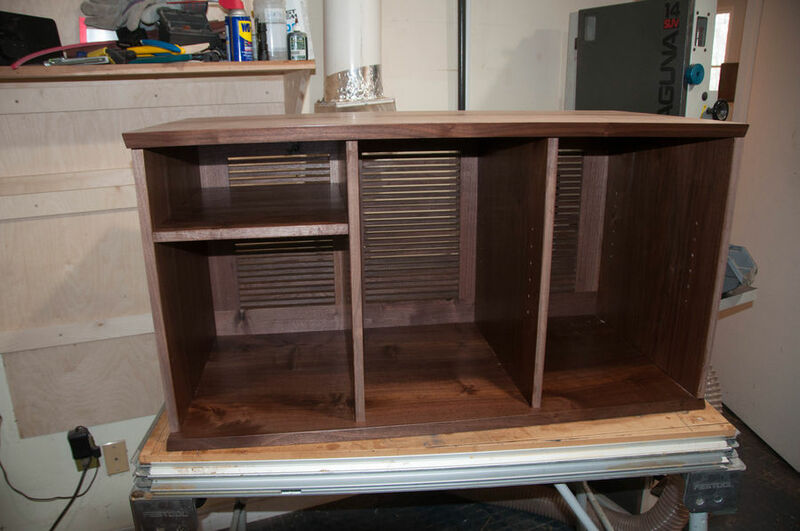 Among other things, this cabinet will store my brown liquids and the glassware that goes with them. Back to the beginning. September 18, 2016 to be exact--almost 10 months ago. I can't believe this project took so long. 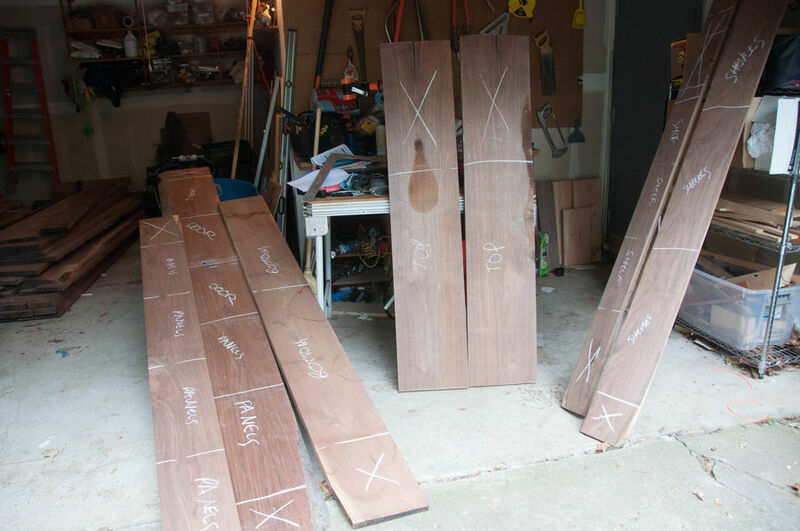 Anyways, here I'm combing through my Walnut collection picking out some pretty boards. Rough stock dimensioning happens outside. It's messy, but quick. 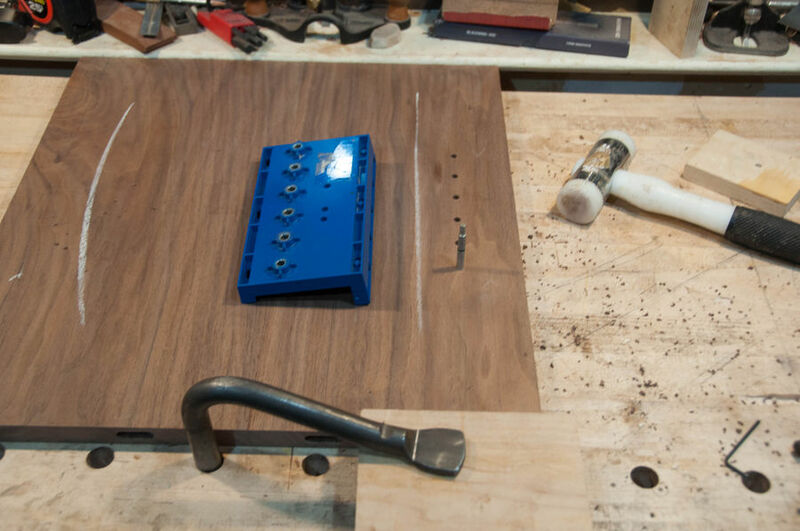 This project started with a bunch of milling and panel glue-ups. Top, bottom, four verticals, three shelves. 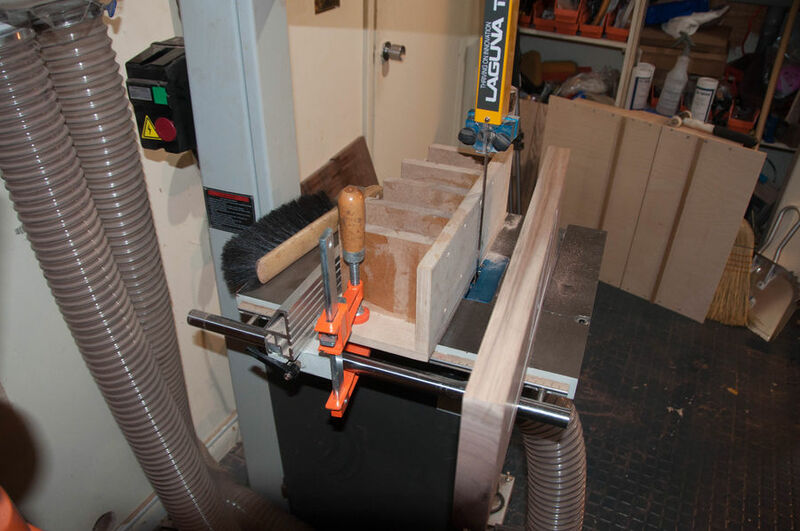 I'll spare you guys 40 photos of milling, dimensioning, and glue-ups. Now I'm putting the case together. Domino joinery throughout. Then I cut the grooves that will house the back panel. 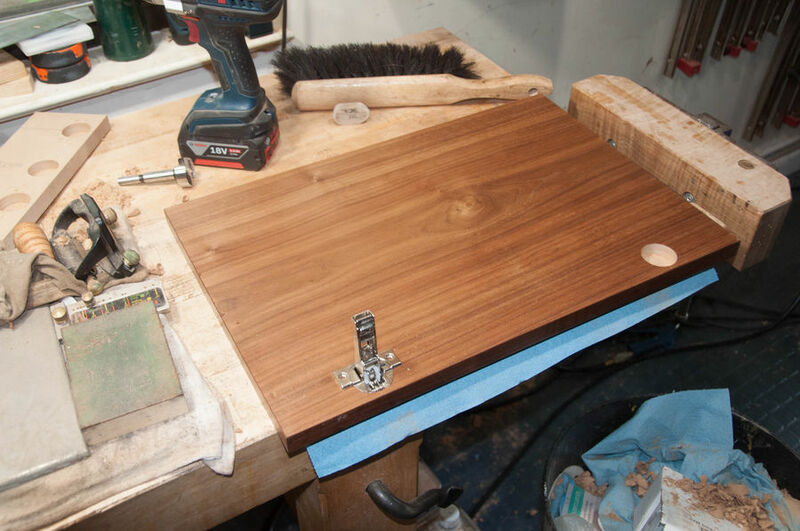 Then, I found a nice quarter-sawn piece and sliced up some veneer for the door fronts. I made about 3x as much as I needed. Better safe than sorry. 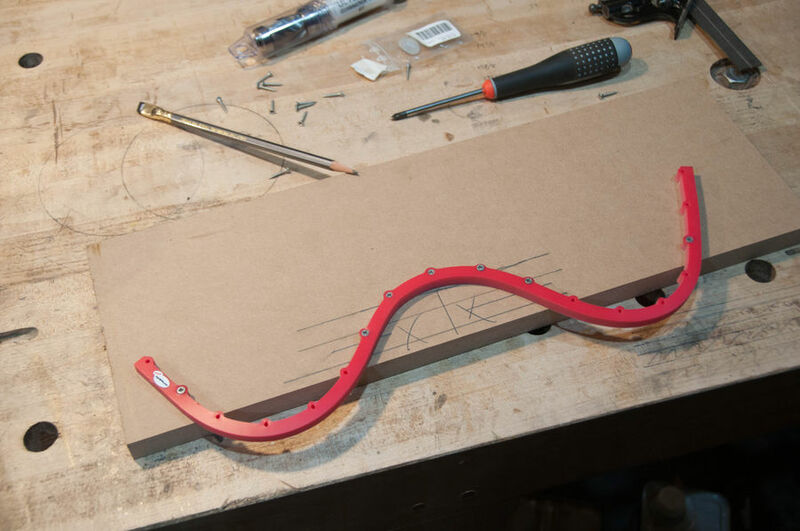 The framework for the back panel is also put together with dominoes. 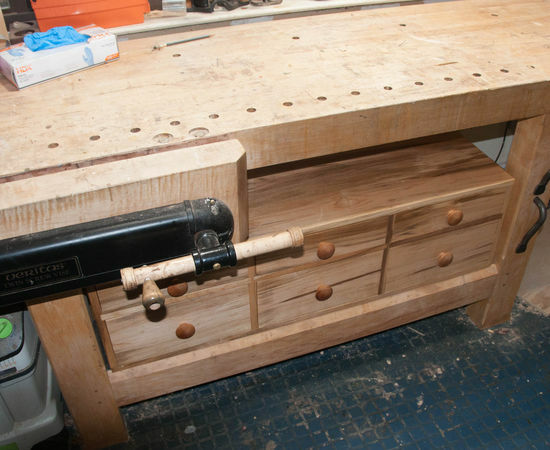 Before proceeding, I did a quick dry fit to try out the joinery, and work out the drawer dimensions. The bottle in the picture is the tallest one I am hoping to fit in here. 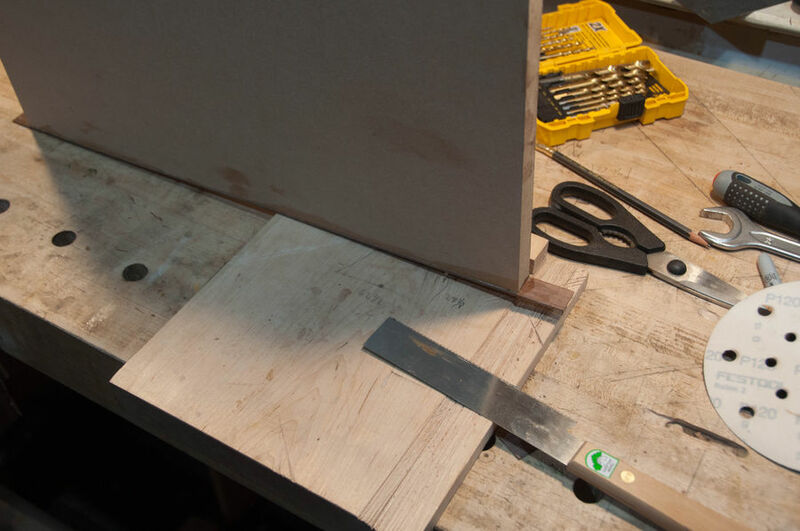 I cut the slots in the back panel using a router and an edge guide. 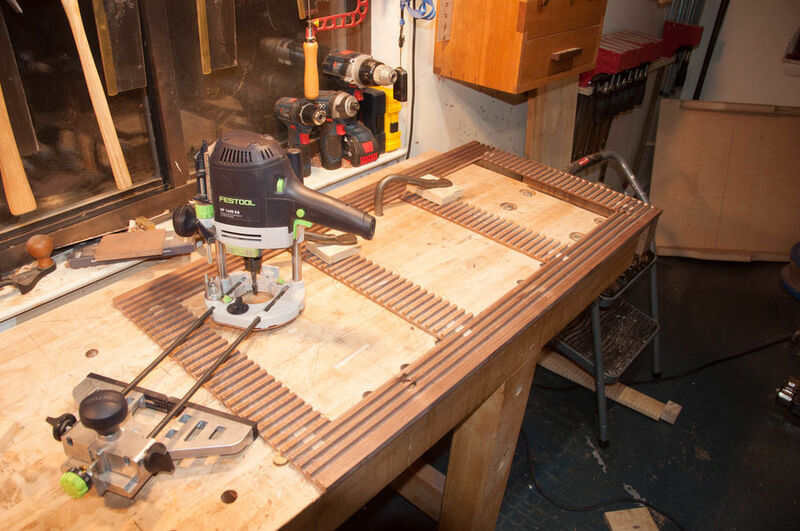 At this point, I didn't yet have a router table, else I probably would have used it! 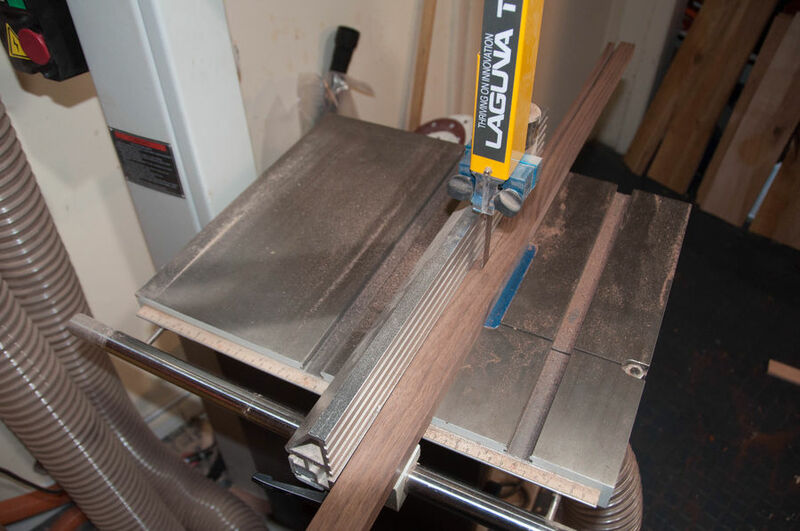 I used the bandsaw to cut the slats out of a variety of Walnut scraps I had laying around. 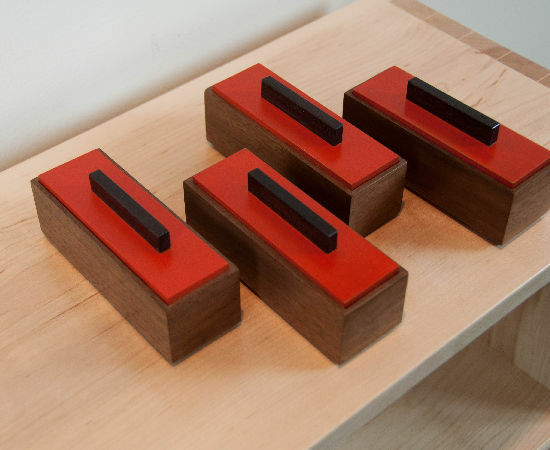 After this, they went through the planer to bring them to exactly 3/8" each. 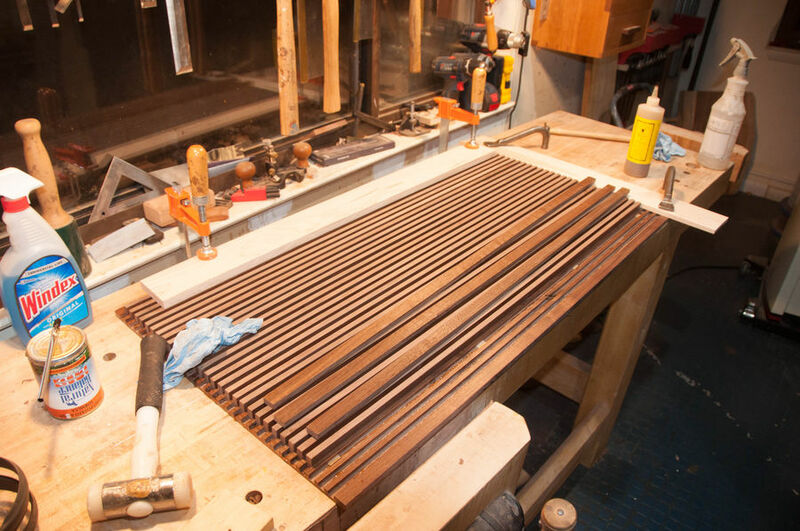 All of the slats were pre-finished before the glue-up, as was the frame assembly. Why? Because I'm not set up to spray finishes, and even if I wanted to, it was too cold by this point. 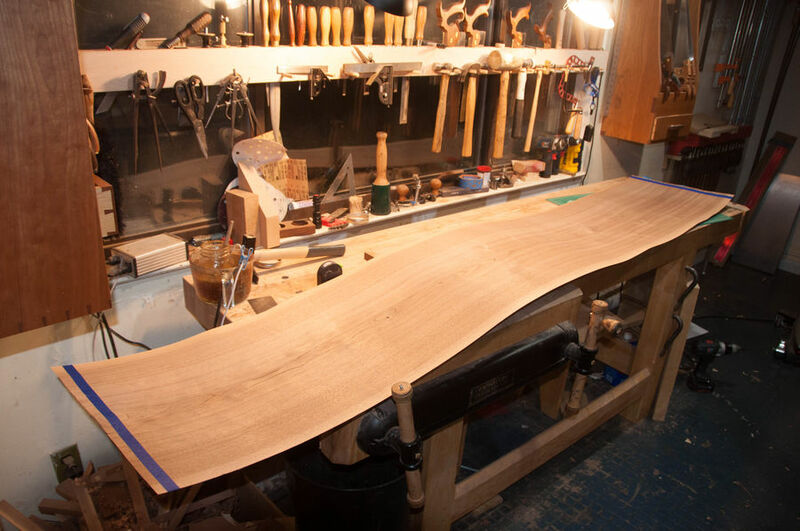 Now, the glue-up. 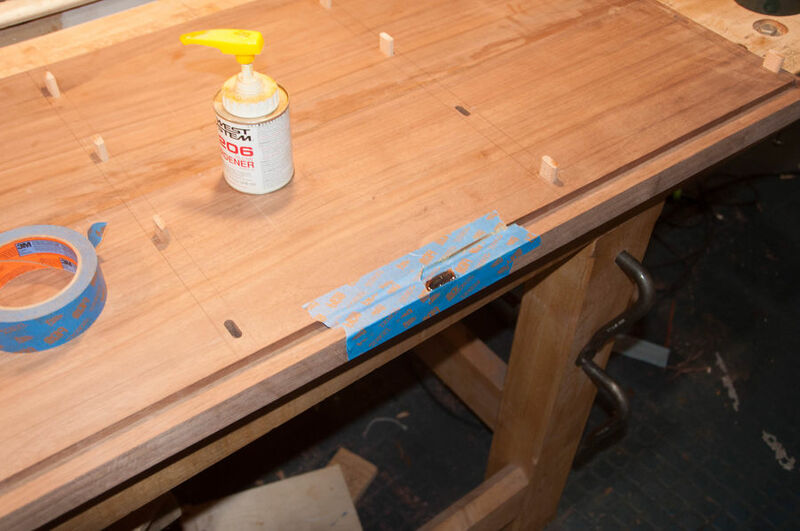 Liquid hide glue for maximum open time. Clamped up to dry overnight. Time to focus on the cabinet again. 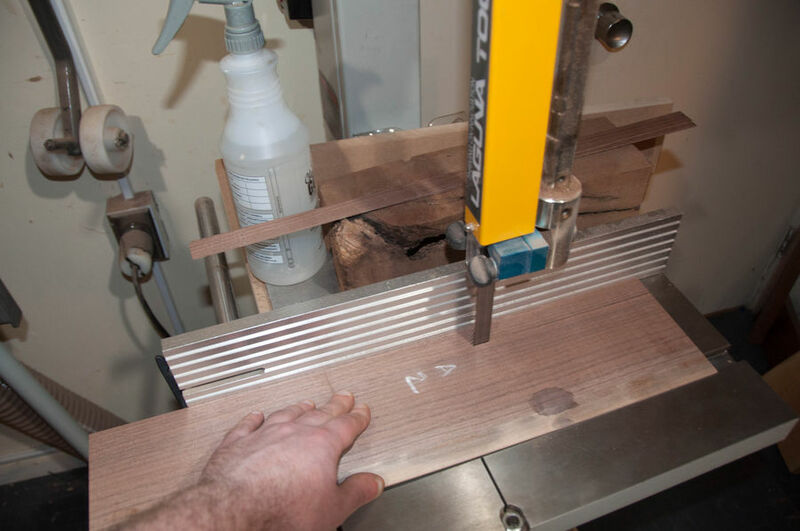 When cutting the bevel in the edge of the top, I encountered a sizeable void. Scrapping the piece is not an option at this point, so I filled it with clear epoxy. I've never filled something so large and visible before, so I was concerned--but it turned out really nice. 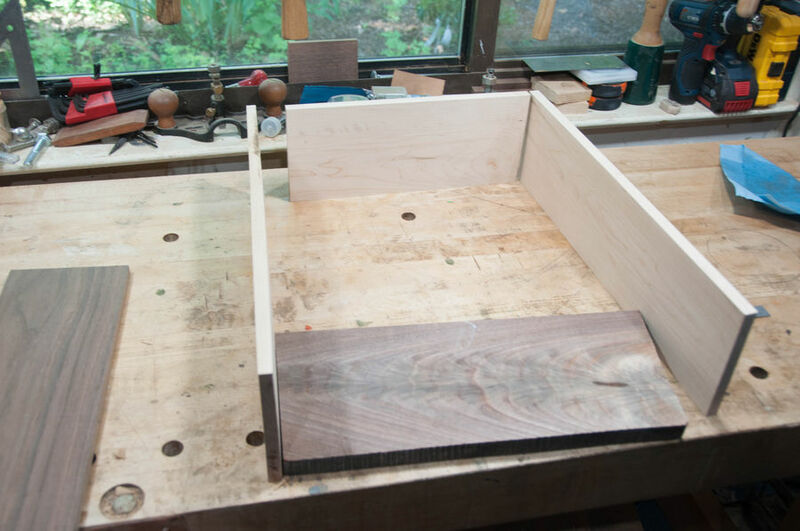 Another preparatory step--shelf pin holes. Easier to do this now than after assembly. 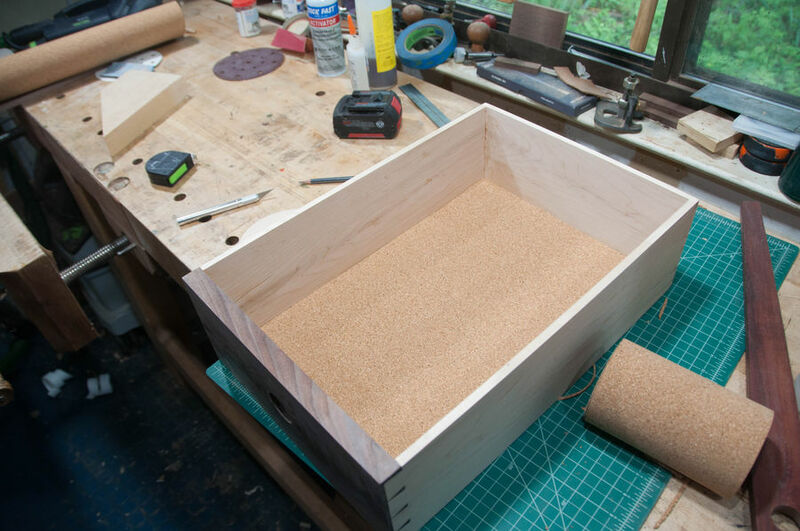 Before gluing up the case, I need to pre-finish the inside. Four coats, GF Arm-r-seal. Then flip the parts and do the other side. 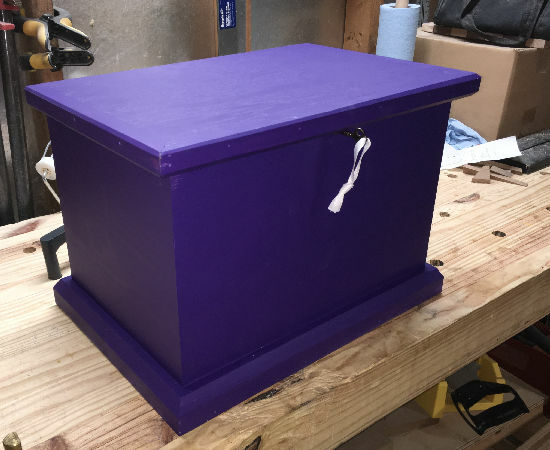 This project involved at least 5-6 rounds of pre-finishing, and a lot of it happened in my living room since it was too cool to do it outside, and too dusty to do it in the shop. The ends of the slats weren't quite even, so I struck a line with my knife and went down it with a chisel to even them up, creating a tiny (but nice looking) gap between the slats and the case sides. Post pre-finishing dry-fit. It's starting to look like a thing! A lot more tiny details before I glue it up. I cleaned up the front edges and brought them to final size, and went around the case a few times with a scraper, sandpaper, etc making sure things were looking right. 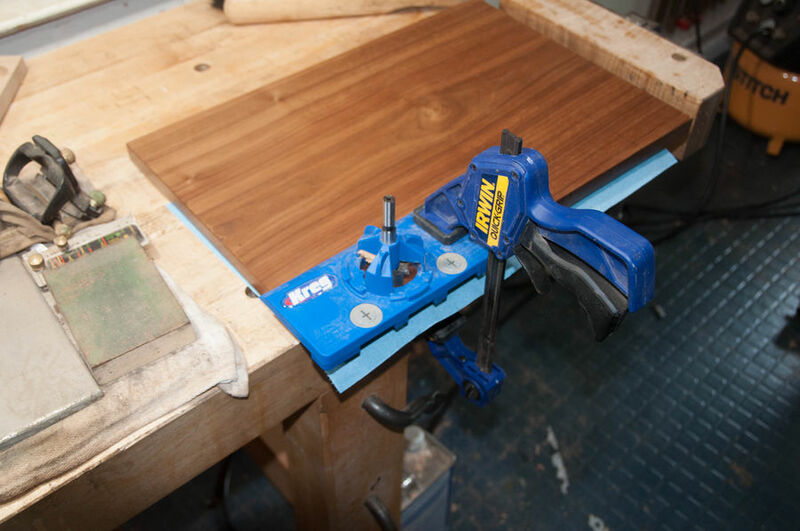 Glue-up! Handling internal vertical dividers like this has always been an achilles heel for me. 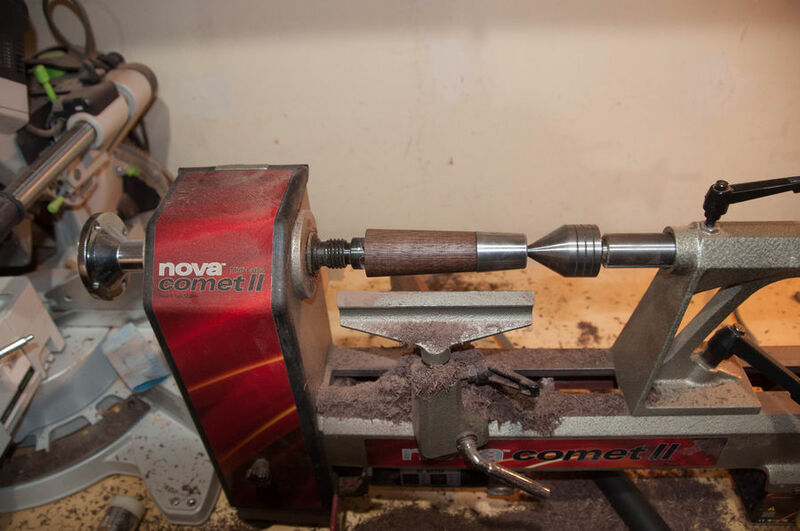 This time I took the time to make some proper curved cauls and get the pressure in the right places. Worked out nicely. 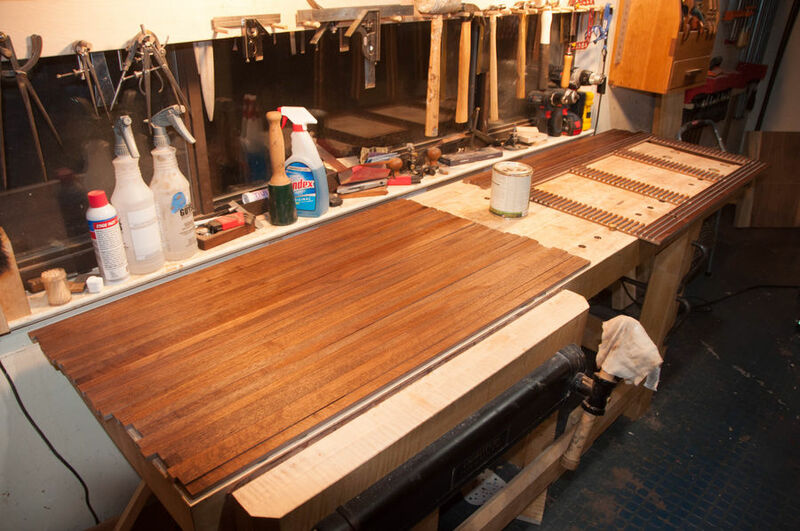 After the glue-up, I deep-cleaned the shop, turned it into a finishing area, and finished the case exterior. Time to make the feet. 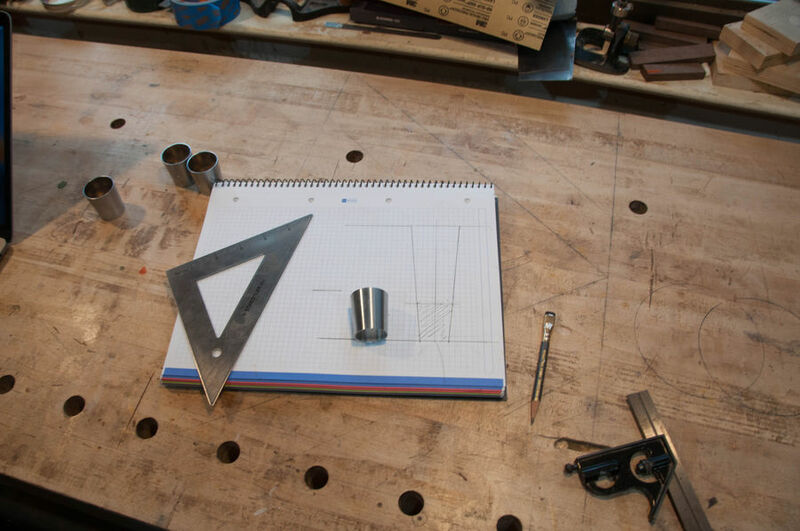 After a long search, and seriously considering paying way too much to get custom ferrules machined, I finally these NOS ferrules on Etsy for a few bucks apiece--they are replacement parts for a McCobb table. I bought extras in case I want to use them on something else. I'm not great at turning. I made 8 legs and picked out the best 4. They are not perfect, but they'll work. The ferrules are just a friction fit. 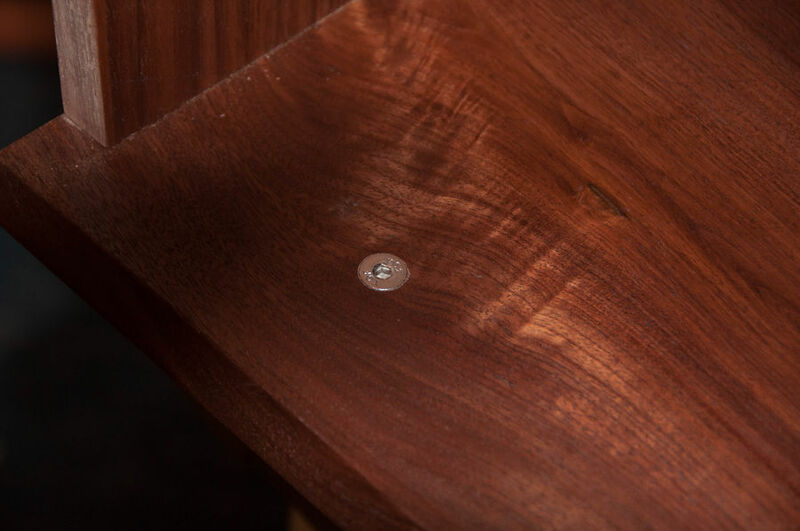 I need to find a screw or pin that I can put through the tiny hole to make sure I never lose them were I to move the piece. 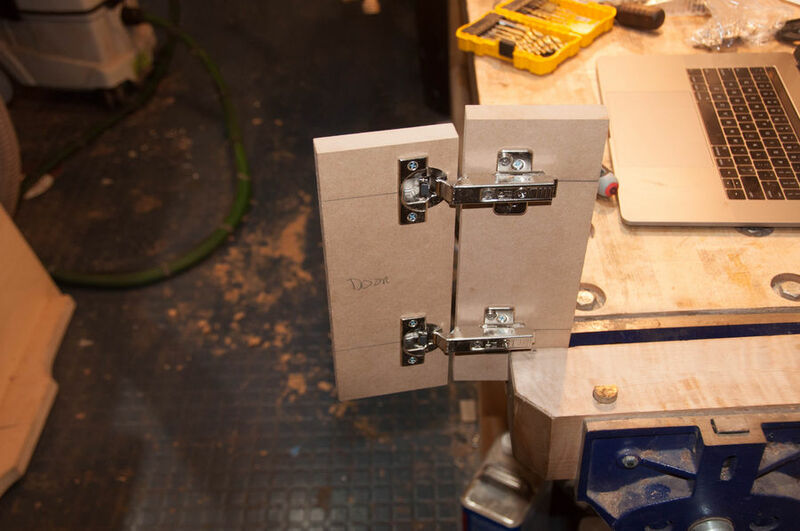 I've never installed these Blum drawer hinges before, so I did a test run with some MDF scraps. Of course, before I can install the door I need to make it. 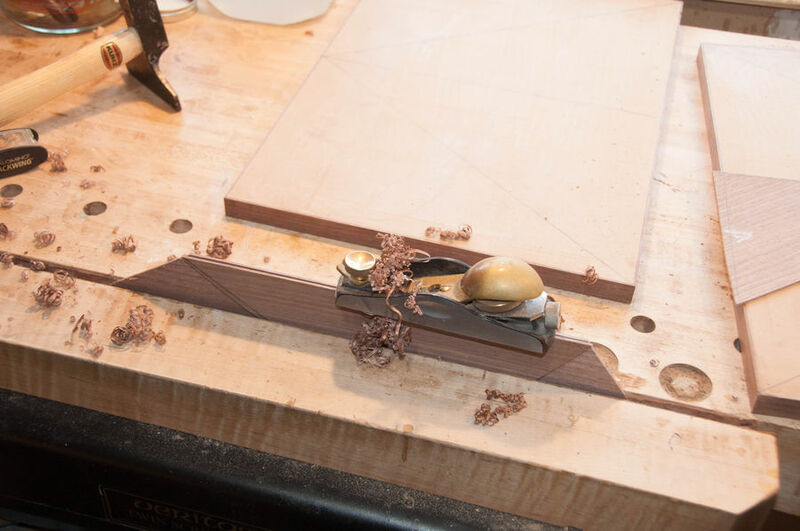 I started by making some edge banding out of some of the less desirable pieces of veneer. 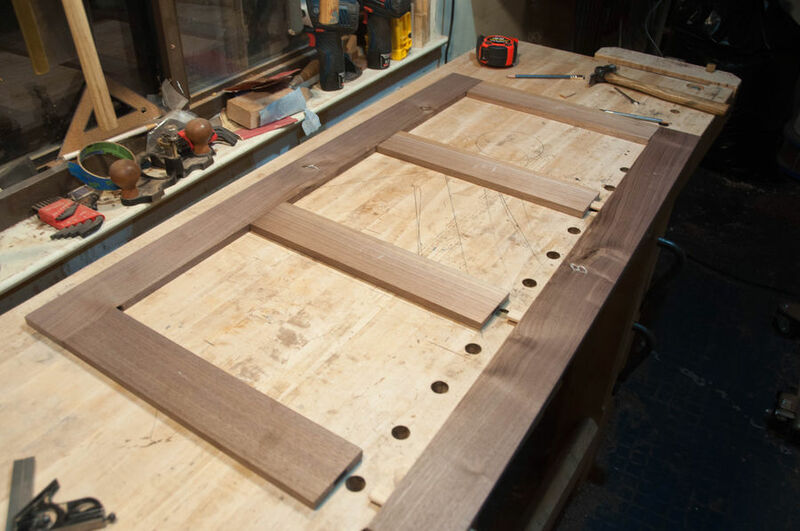 The veneering process for the doors has a few steps--all using a veneer hammer and hot hide glue. 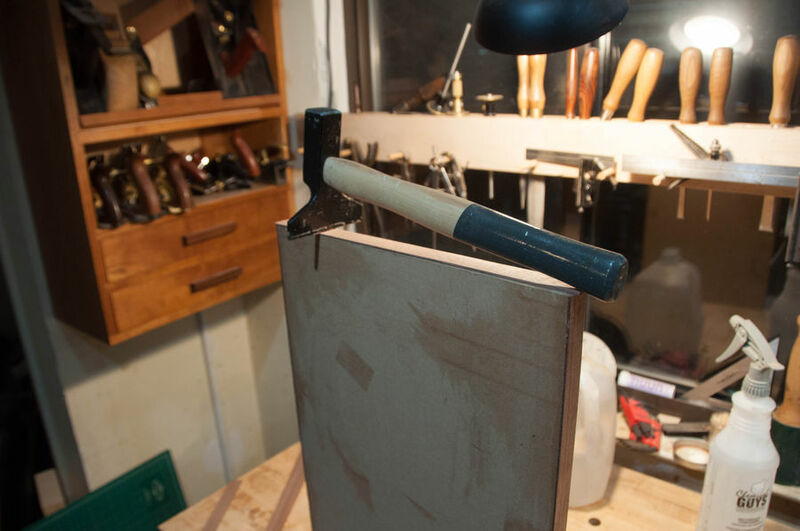 The first step is to start hammering on the edge banding. 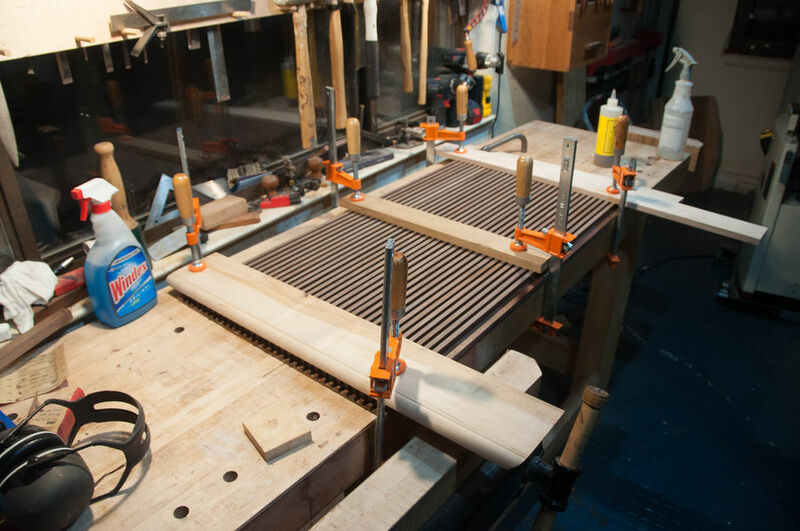 I'm going to jump back and forth between other tasks during the process while waiting for the veneer to dry. Another little miscellaneous task: creating some cutouts in the shelves for cable management. I will have some equipment in this cabinet, so I need plenty of room for cable routing. I impulse-bought this router guide thing a while back, so I figured I'd try it out. 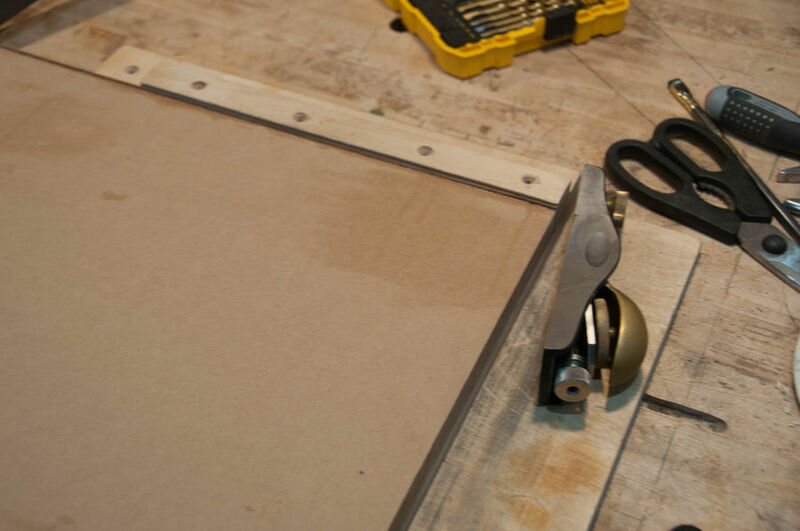 First, screw the guide into a piece of MDF to make a template, like this. 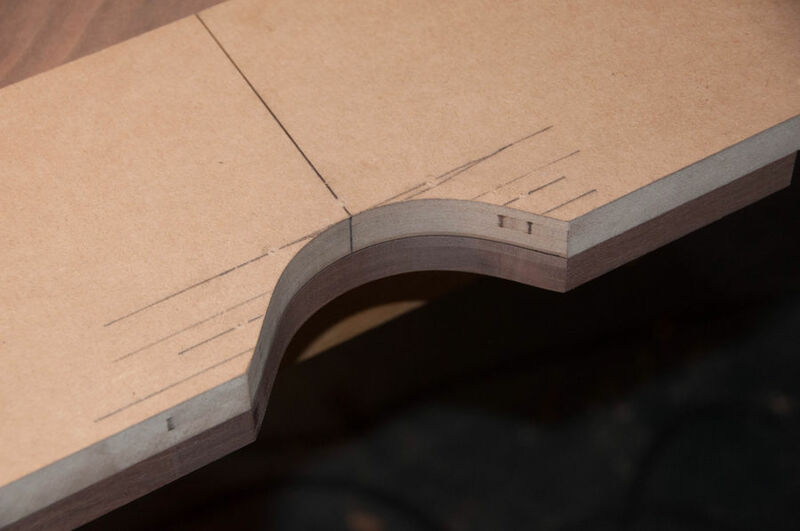 Then, using a flush trim bit, make the MDF match the guide. 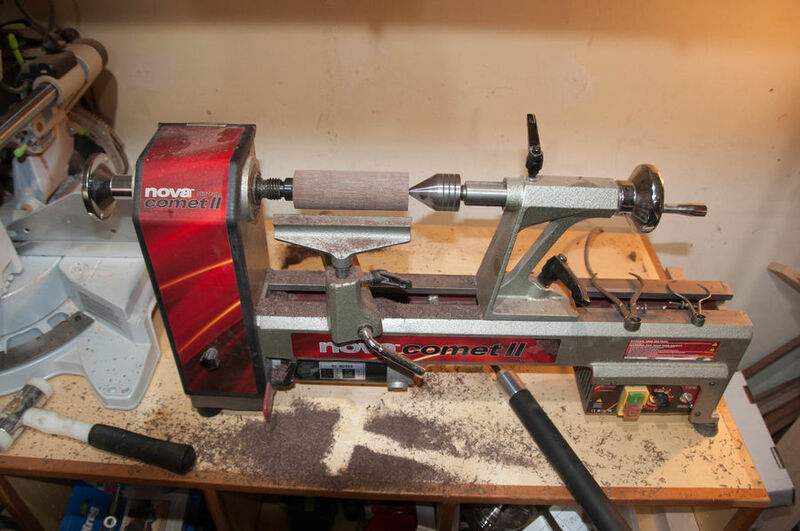 Yes, this router bit costs as much as a decent router. Yes it's worth it. 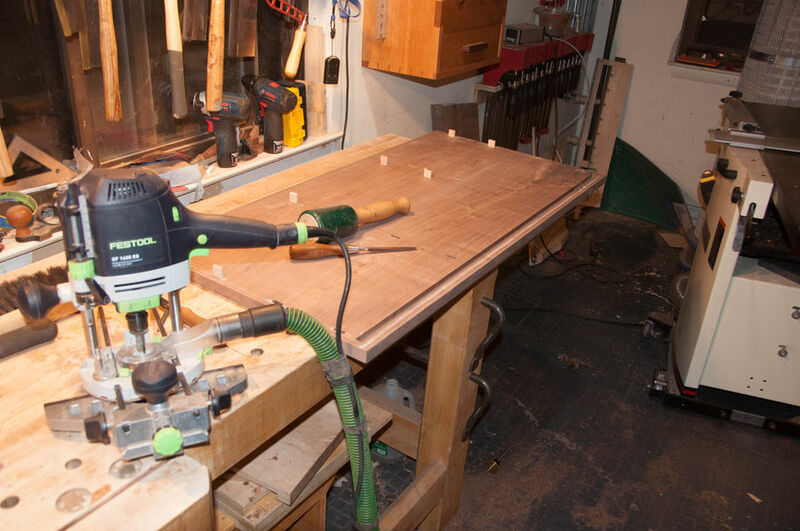 Then, remove the guide and use the router to make as many copies of the template as you need. Back to the doors. 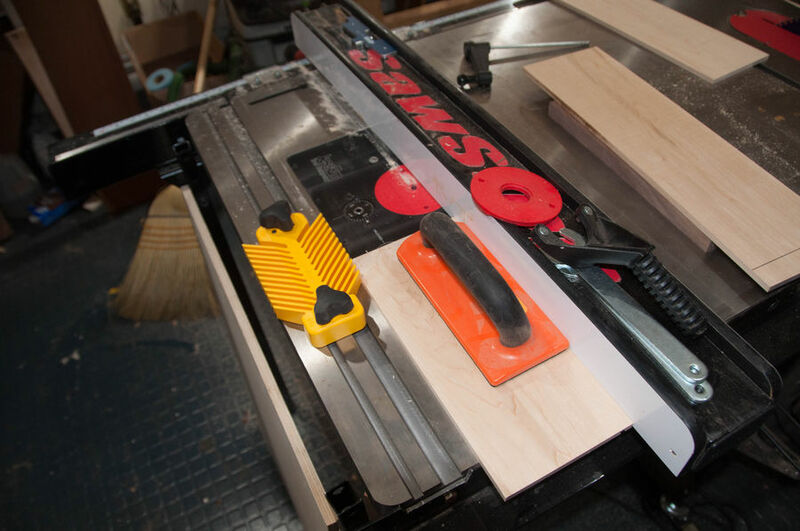 First I trim off any excess edge banding with a flush trim saw. 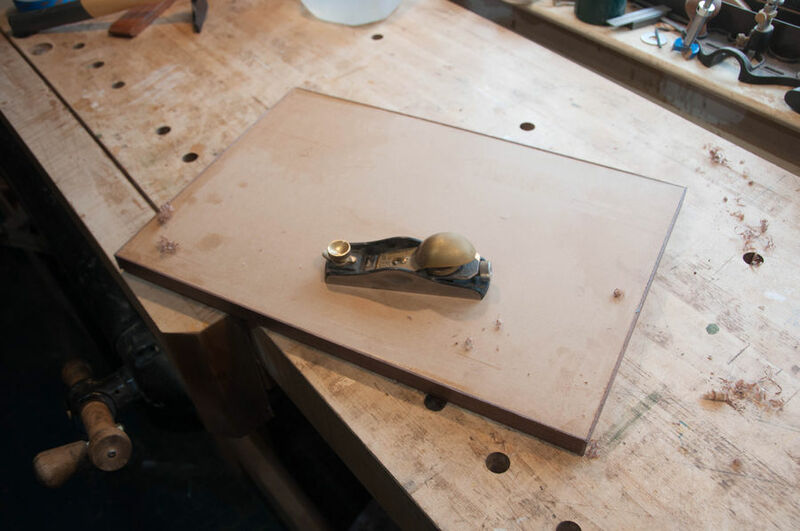 Then knock off the last little bit with a block plane and shooting board. Now I can hammer on the other 2 edges. 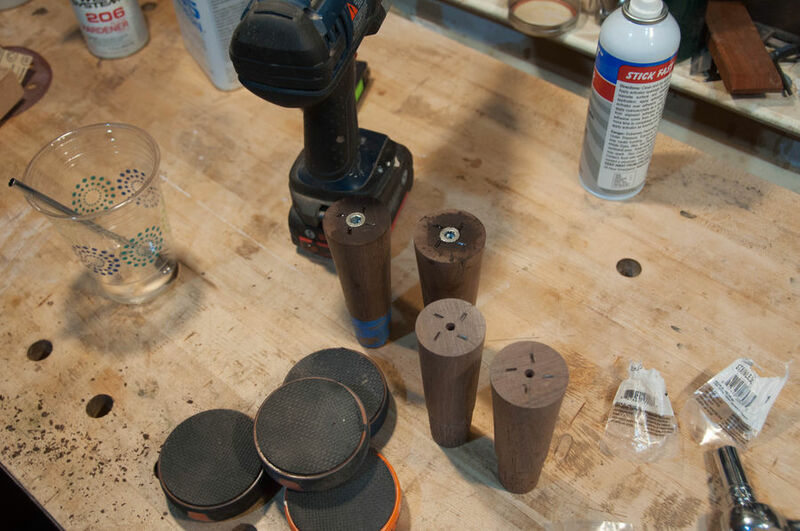 Once the edges are done, they are flushed to the faces, then the faces are toothed for the face veneer. One last check before I hammer on the face veneer. 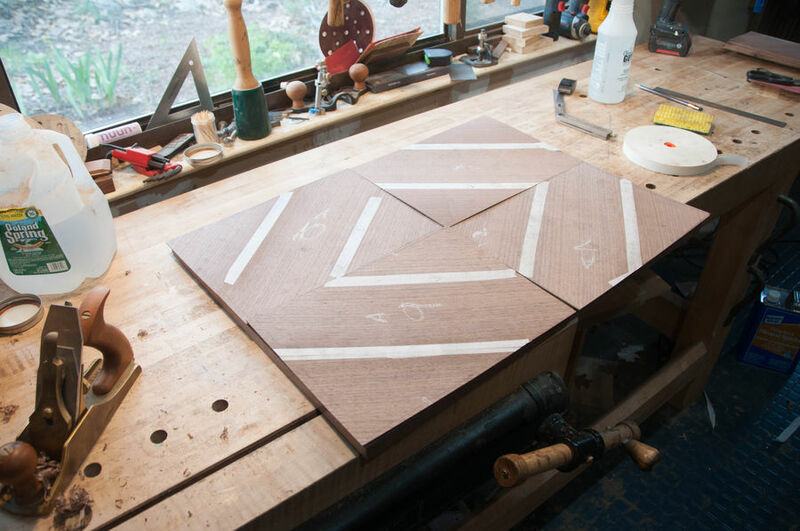 You can see the layout lines for the diamond pattern. 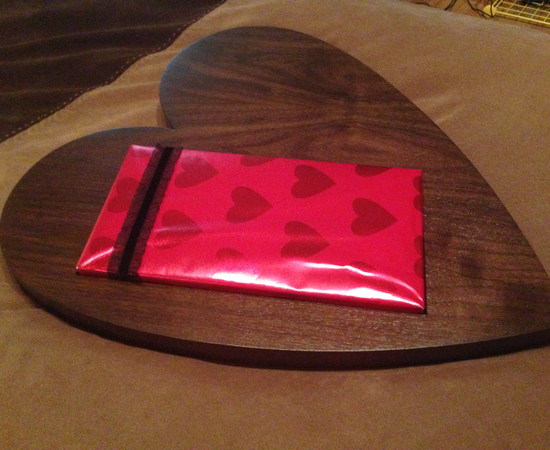 Now, I need to make the veneer layup. 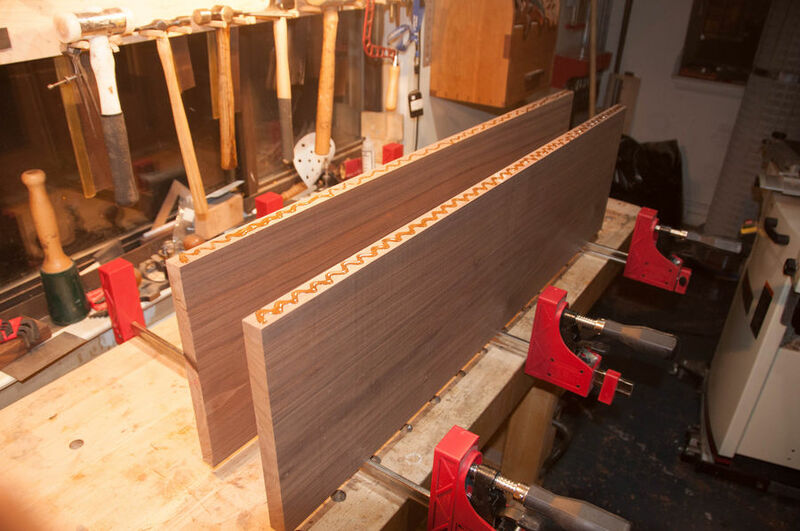 Each veneer joint is match planed, then temporarily joined with veneer tape. I hammered these down in four sections--two per door. 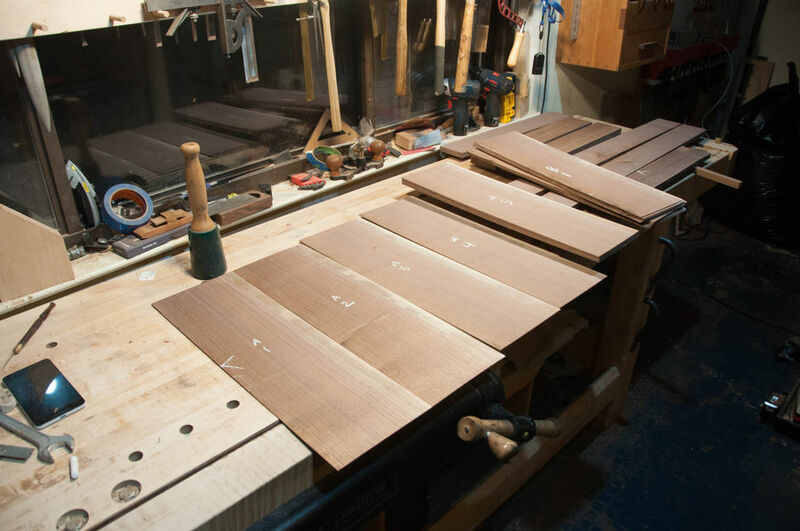 Each was squared up on a crosscut sled. 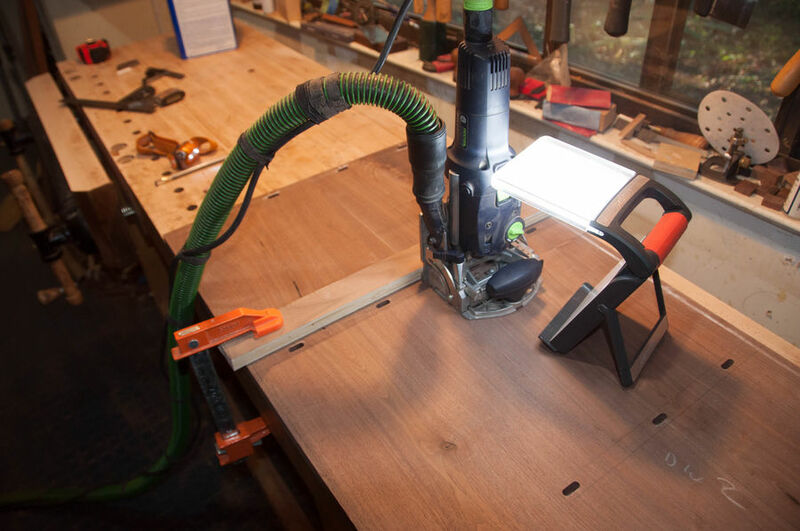 One of the advantages of working with thicker veneer (1.5mm) is that it can be worked more like solid wood without it falling to pieces. 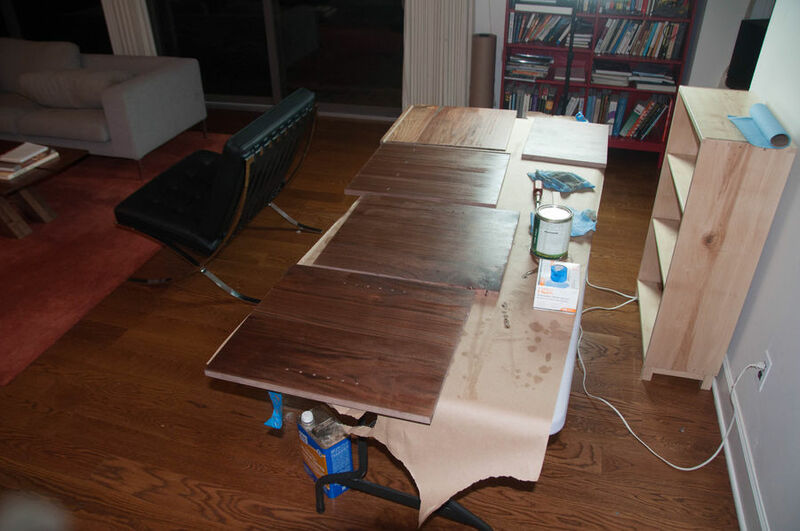 After this, I hammered the veneer down and waited for it to dry. While it was drying, I made some holes in the bottom to allow cables to enter the case from below. 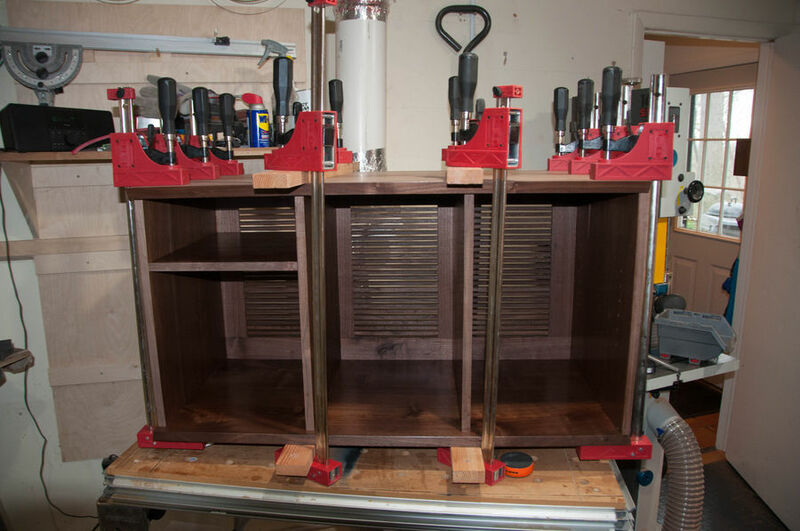 I was beginning to become concerned about the door thickness protruding too far past the edges of the case top and bottom, so I decided to order a sheet of commercial (1/42") veneer and use that for the back of the doors. Here, I'm putting threaded inserts into the feet so I can screw them to the case. 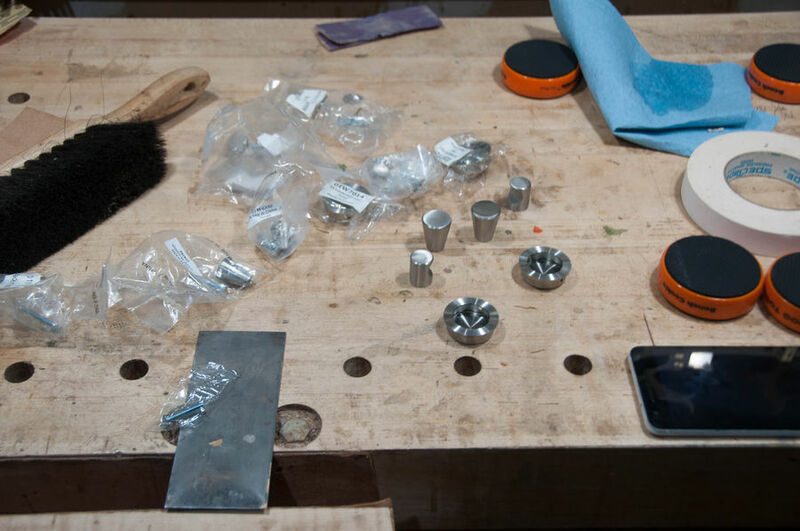 Then I countersunk+screwed them to the case with some nice looking stainless hex screws. I ordered every plausible looking stainless steel door pull that Lee Valley had on offer and rejected all of them (at least I have spares for future projects? Will I ever use them?). In the mean time, I've cleaned up the doors and finished them. Now it's time for the hinge install. 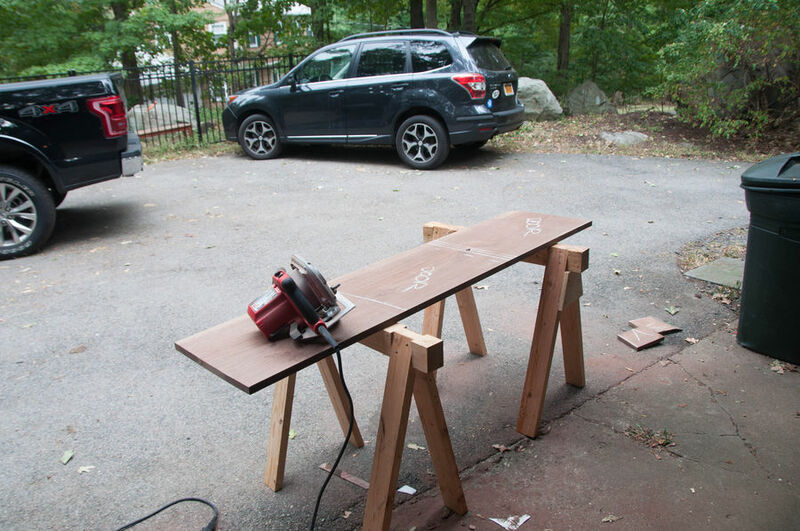 This jig made it pretty dummy-proof, but the drill bit that came with it was garbage, so I used my own. Though this isn't the most attractive hardware on earth, I love the adjustability. 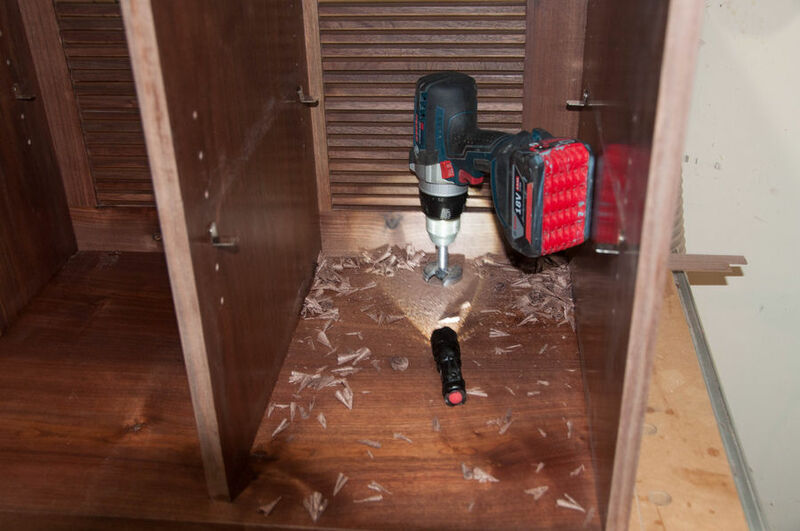 It takes 90% of the stress out of installing doors and drawers. However, this drawer will not use hardware. Space is tight, so I want to waste as little as possible. 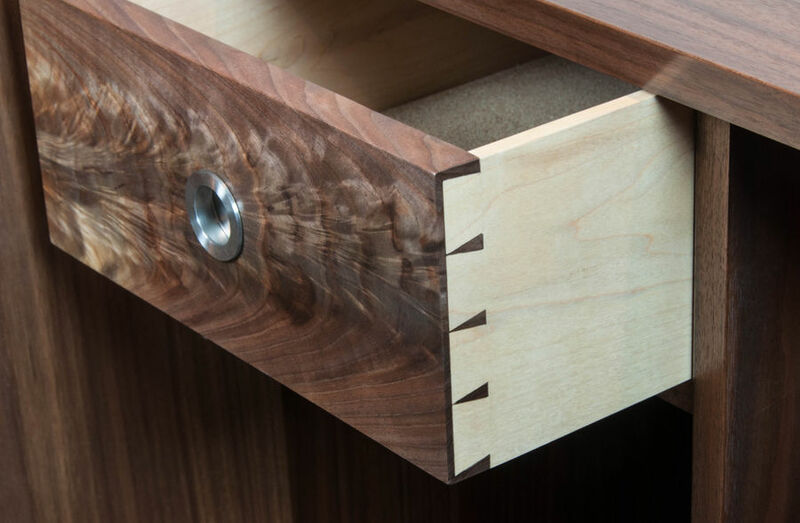 I dug a nice piece of crotch out of the Walnut collection for this drawer and milled up the sides from some Hard Maple I had laying around. 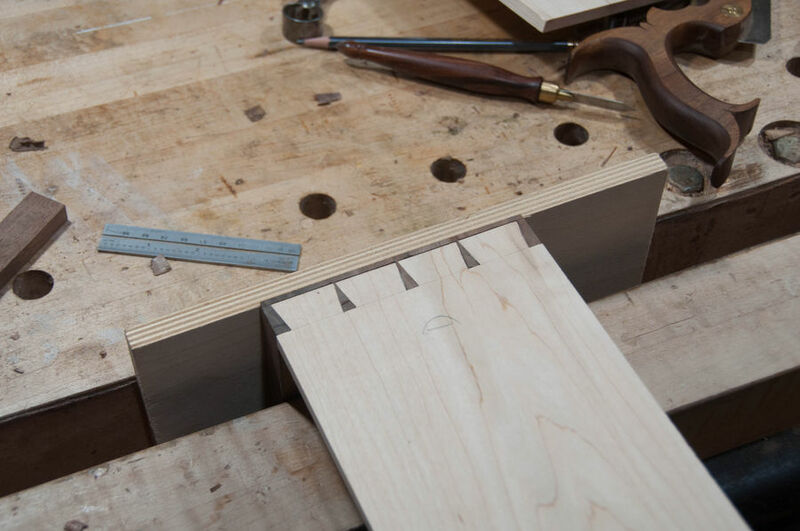 It's much nicer to cut the drawer bottom grooves before the dovetails. 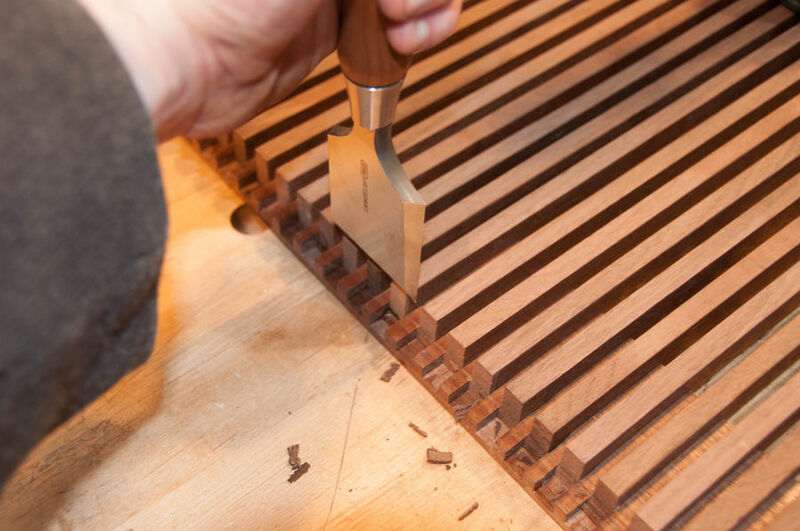 Makes it almost impossible to screw up the layout or transfer during the dovetailing. I also took an opportunity to drill out the recess for the pull. I needed a super low profile pull for this because it's going right behind a door, and I've been looking for an opportunity to use one of these for a while. 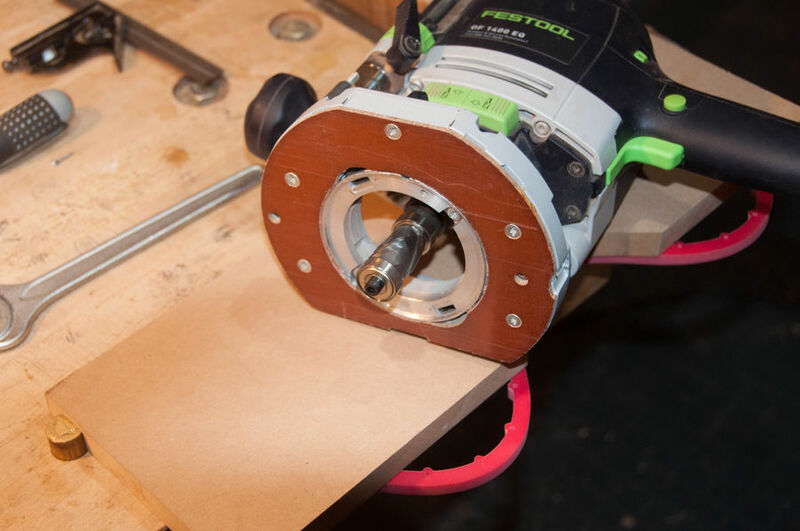 Currently I have the pull friction-fit into the recess. 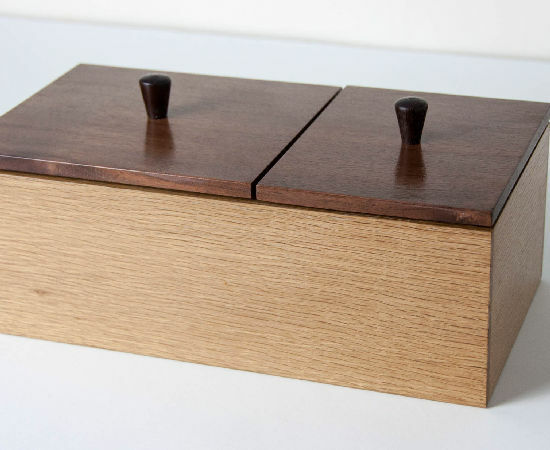 I would love to figure out how to screw it in--it came with screws that go laterally into the drawer front. I just have no idea how to get a screwdriver behind them to put them in. 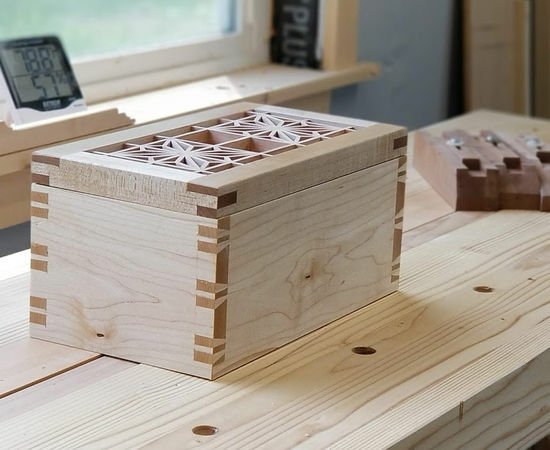 Then I cut the dovetails. 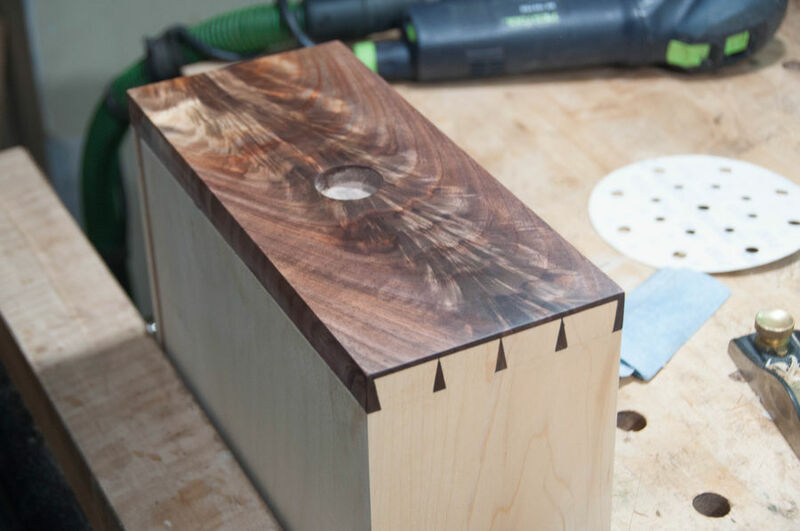 I didn't take a ton of pictures of this because I've documented my dovetailing process--literally--dozens of times before. 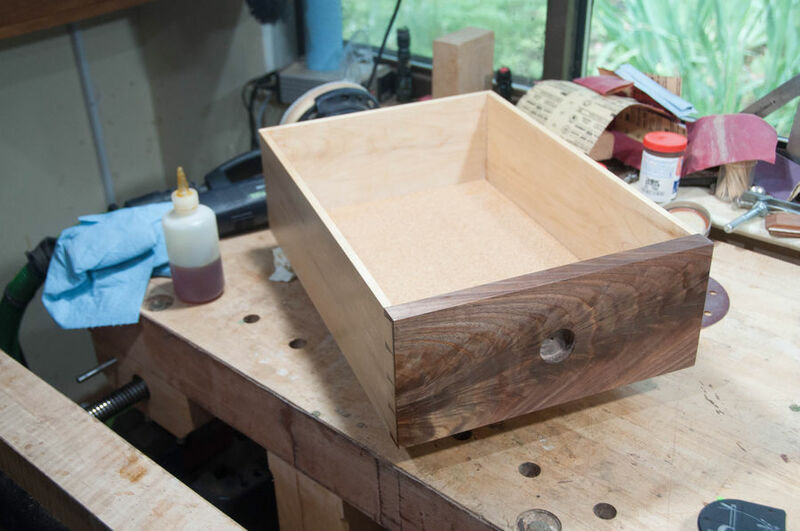 The crotch figure made the dovetailing process especially dicey, since the grain was not going in the usual directions, and in some places it was very weak and prone to crumbling. Definitely put my CA glue skills to the test. 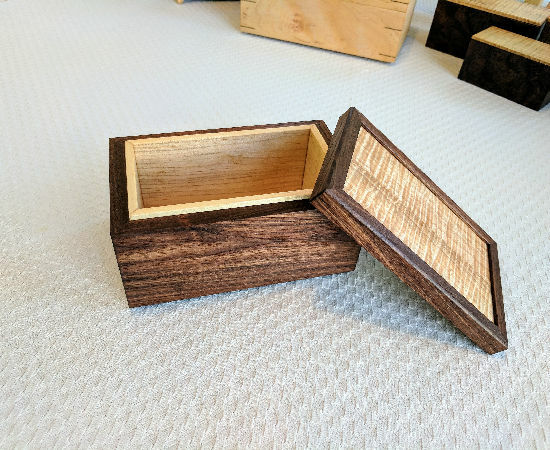 These are not the nicest dovetails I've ever made, but they cleaned up OK. 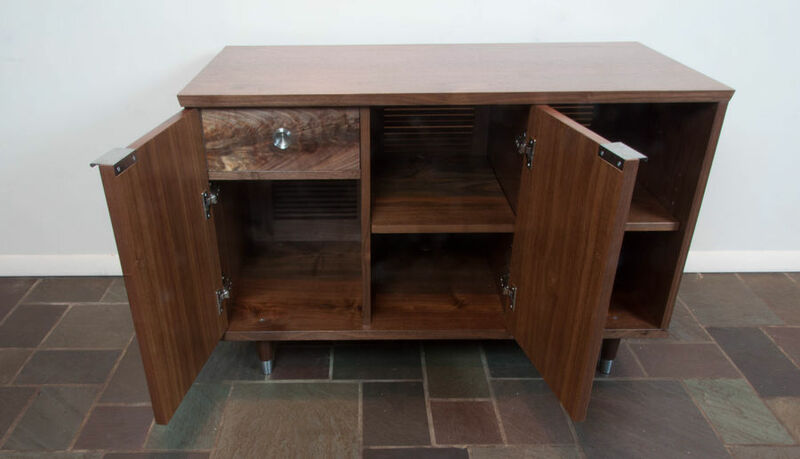 The huge contrast between the Walnut and Maple hides a lot of sins. 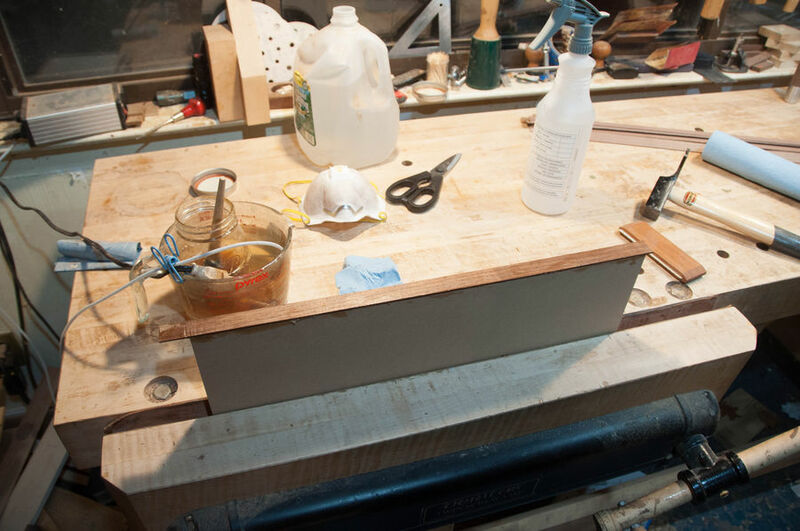 Since the drawer is meant to hold glassware, I lined it with cork. This creates some friction to keep things from sliding around, and a soft surface to set the glasses on. The cork is attached with double-stick tape, so I could always remove/replace it later if needed. 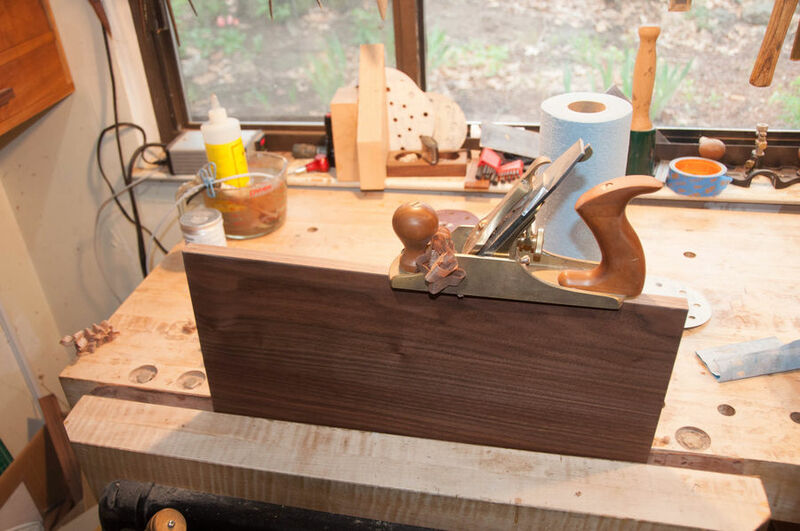 I finished the drawer with Amber Shellac and Wax, applied with a pad. 5-ish coats. 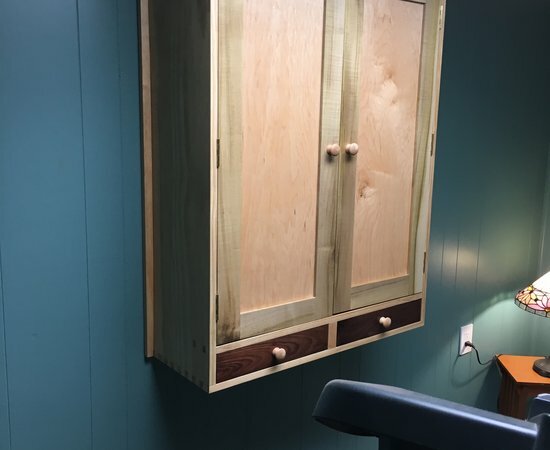 I don't like using oil-based finishes in areas that will end up enclosed. Finally, I installed the door pulls by creating a mortise in the top and back of the door, then driving two screws into the back. 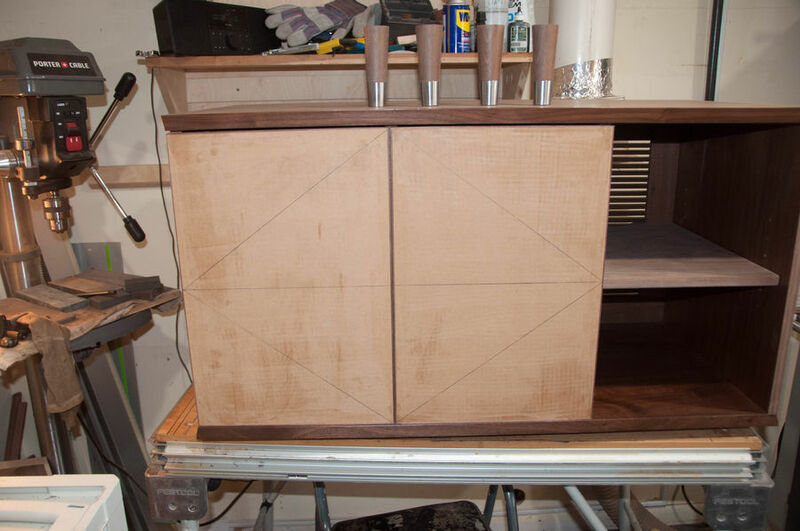 This picture is from the middle of the process--after creating the top mortise but before creating the one in the back. 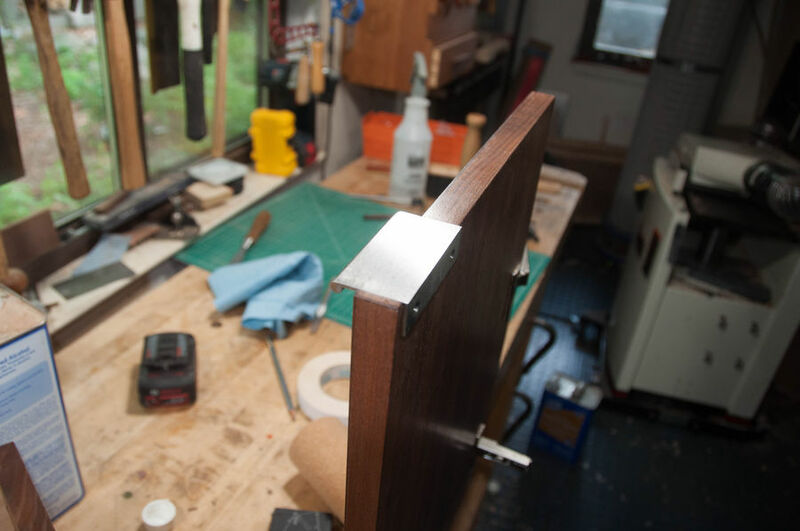 I could not find stainless pulls in this style, so I ended up reluctantly using brushed nickel instead. These are from Mockett. Wow, this project is stunning. 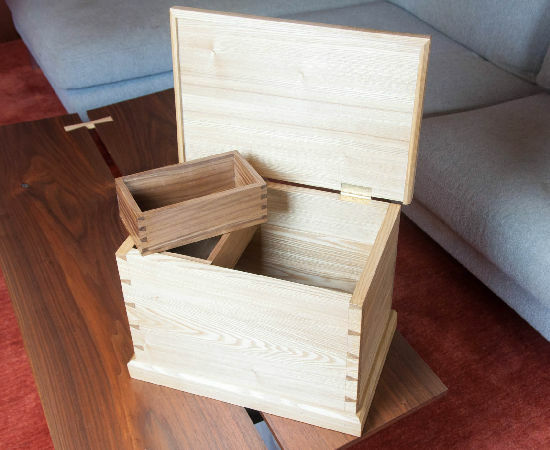 From the veneer front, the crotch drawer front, the hardware and pretty much everything else is amazing. Thanks for sharing. Gorgeous use of grain and the attention to detail...one of the best projects I've seen around here. 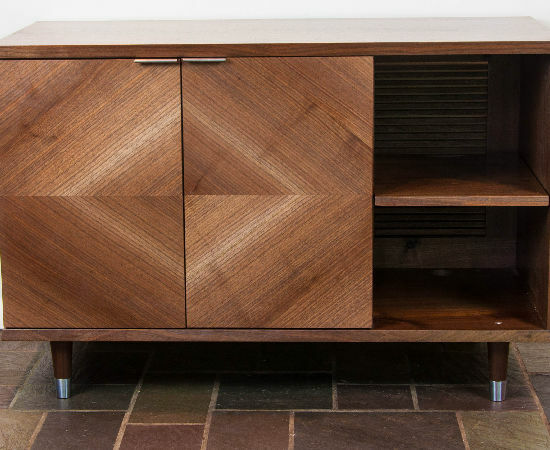 Usually not a huge fan of veneer but this might have changed my mind.